There are a few things you need to remember when choosing an office cleaning company as not all cleaning specialists are the same. 1) Ask for referrals – probably the best way to finding an office cleaning company that is efficient and reliable is by asking local business partners, associations and other facilities managers if they have used anyone good before. 2) Shop around for a few quotes – it is important to cast your net across a variety of office cleaning companies so that you can get the most affordable and quality quote for your business. Be sure however to include everything you need in your quote and remember to compare apples with apples. 3) Decide on the areas you need to be cleaned – if there is a specific problem area in your office, it is advisable that a representative from Simply Cleaning comes to have a look at this area in order to quote more effectively and therefor there are no hidden surprises. If the area you want cleaned has stubborn grime for example where specific chemicals need to be used, then it is better if this is discovered a few days before work commences. 4) Find out what equipment they will be using – You may get a cheap quote only to find out that you need to supply the equipment. It is far more effective that the office cleaning company provides its own cleaning equipment as they will know how to use it and will have a copy of all certifications needed for Health & Safety and COSHH. 5) Make sure the office cleaning company has insurance and is properly accredited – You will be able to ask professional office cleaning companies like Simply Cleaning for proof of insurance and accreditations. This is in case their cleaners become injured on your premises. Simply Cleaning follow a strict Health and Safety protocol and have £5m public liability insurance, £10m employer liability insurance and £5m Product Indemnity. 6) Choose a company that offers a satisfaction guarantee – good office cleaning companies will take pride in getting the job done right first time. They will also make sure that any issues that you have are dealt with promptly and in a friendly manner. All in all you need to look for a reputable and reliable office cleaning company that will take care of your premises and belongings in the best possible way. Call Simply Cleaning we have the most professional and skilled cleaning team and use the latest in cleaning technology, commercial cleaning products and cleaning services to provide your staff and clients with a balanced and healthy environment. 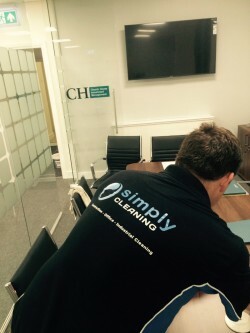 Simply cleaning can carry out a one-off deep clean or regular scheduled contract cleaning on a daily, weekly or monthly basis built around the individual needs of your commercial site and business.